One of the few black actresses in 1950s Hollywood. She received a nomination for the Best Supporting Actress Oscar in 1960 for Imitation of Life, playing housekeeper Annie Johnson. Some sources are indicating her death was one day later. 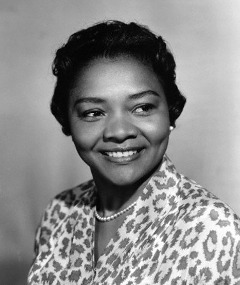 But see Paul Vitello, "Juanita Moore, Oscar-Nominated Actress, Dies at 99", The New York Times, 3 January 2014: "died on Tuesday in Los Angeles." CNN concurs with the date, both organizations giving as their source Moore's grandson, Kirk Kelleykahn.